We've been growing these on and just updated our pages for the nursery to reflect our current supply. I don't know about appetite suppression, but I like their looks! I posted a photo of this plant earlier, but it wasn't in flower. This is the flower. The tips of the petals barely open, but that doesn't matter. The color is unique, along with the leaf color which is repeated with the leaflets along the flower stem. It sure does stand out right now. I was in the greenhouse the other day checking out flowers I could photograph...but this caught my eye. Haworthia reticulata var. subregularis was getting enough sun to bring out some colors and I thought...hey, there's my flower. So here it is. Several Echinopsis hybrids are about to flower and this one is 'Rose', a Paramount hybrid. It's one of our favorites and it's very dependable. Yesterday, when I was feeling a bit better, I took a photo of this little group of Frailea mammifera. I've always liked these little gems but we haven't had them around for quite a few years. When they flower I'll get another post up. This wasn't one of my better days. Earlier today I was headed back to the house coffee in hand, escorting the dogs from their morning run, and I tripped on a hose. The end result was that I made a 2 point landing on the cement patio...the 2 points being my left hand and my head! (The right hand was busy holding the coffee cup.) Crack! And, with blood all over the place, all I could think of was that I had broken one of my favorite coffee cups!!! The end result was that I received abrasions and contusions (and headache) which look a lot worse than they are. The CT scan cleared me of anything worse. So...I look like I've been in a big fight with someone...and I lost. Lynn-Marie suggested that she take a picture of me in among the cacti with the note: "Enjoy your plants, but don't hug the wrong ones!" It's common name is "Silver Thicket". Ours has never been especially "silver". Maybe it's just an odd ball...or maybe it's just the Oregon weather. Sure, that's it. The Oregon weather has been receiving a lot of complaints recently by people getting tired of overcast days, so why not one more thing! Another early bloomer, Lithops pseudotruncatella ssp. volkii, which is pale bluish-white with few or no dusky dots on the leaf face and very few other markings. The yellow flower is typical of the species. I'm pretty tired tonight so just a few quick photos from around the yard. I was a nice summer day today - finally - with temperatures which just barely broke 80F. And the humidity was high...for us. I know our relative humidity in the mid 40's gets a good laugh from our friends in Florida, but we're spoiled. We expect dry and moderate summers! I'll be back tomorrow with some succulent plants. Until then...Enjoy your plants! Lynn-Marie's been working on a few prints of some works which originally appeared in The art of the Scythians: the interpenetration of cultures at the edge of the Hellenic World by Esther Jacobson, for which Lynn-Marie did the illustrations. These are portrayals of ancient artifacts of the Scythian peoples. The original portrayals are in black and white but these prints will be in color. This is the green leaf form of Echeveria pulidonis (in contrast to the more common blue leaf form). We've had a hard time keeping this in stock, but it's back...or will be very soon. They're quite easy to grow and with very little coaching (adequate light), the red edges are accented. A local grower had a few of them and, not knowing the botanical name, gave it a name of it's own..."Zombie Toes". Don't ask me, I don't know why. Just reporting!!! This is a closeup of one plant in our collection of crests - Oroya borchersii crest. It's a good thing these were named before the crest occurred because it would be pretty much impossible to tell either the genus or species from the crested form. I've been working to update our Lithops pages at the nursery during the last couple of days. The list is now updated but I'm still working on upgrading some of the image pages. The new list begins here. The sale is done and we're back at the nursery and we took today to rest up a bit. Also took the camera out and took a few shots. This is one of the several plants of Astrophytum myriostigma 'Onzuka' which were flowering today. Our cold and damp weather hasn't exactly been conducive to flowering, but they're trying nonetheless. The sale was a bit cold and wet and I'm sure it kept a few people away. This is not the weather we're supposed to be getting at this time of year! Hopefully, August will bring some more pleasant weather. I took this photo last month. Just haven't had enough time during the last few days to take some pictures. This is Agave lophantha 'Quadricolor', one of my favorite variegated Agaves. It's not hardy enough to take our winters, but I don't know what it is...we just can't resist a nice Agave. And, luckily, many of them will stay quite small for quite a long time when grown as a pot specimen. Naturally, it rained this morning, but it's supposed to be nice by this weekend. At any rate, there may be a bit of an absence on my part due to all the work of preparation and the long days at the sale. We'll see. Nothing special tonight. Just a shot across one part of the main greenhouse. All our time right now is spent potting up and preparing plants for the sale this weekend, but I'll try to get some more pictures tomorrow. The second show & sale of the OCSS in 2011 is happening this coming weekend at the Stark Street location of Portland Nursery. We'll be there Friday and Saturday, 9 am - 8 pm, and Sunday, 9 am - 4 pm. If you're in the Portland-Vancouver area, come by and say hello. Back with a picture later tonight. 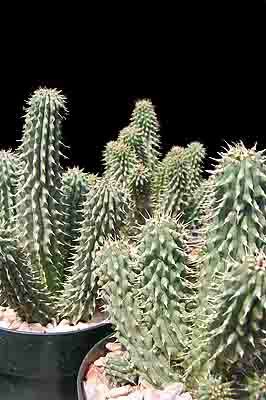 Today we bring you a gathering of crested old men (Cephalocereus senilis). We've gathered a fairly good collection of these hairy critters, just 'cause we like them. And they are really getting to be old men. We've had this plant for a number of years and most of the time it tends to get ignored as we go about our everyday chores. But it doesn't seem to mind. One of the several Copiapoa tenuissima crests or monstrose plants we have in our collection, this one was flowering yesterday, so I'm sharing it with you. These are relatively easy to grow and bloom with regularity in our greenhouse. If you're in the Portland area later today, Saturday, come on over to the Portland Nursery on Stark Street (5050 SE Stark) at 1 pm, where I'll be leading a workshop titled: "Weird Plants: Growing Succulent Plants 101". Hope I'll see some of you there. The flower on this Mammillaria is simply amazing and has always been one of my favorites: Mammillaria guelzowiana. I have to admit that those barely noticeable but very effective hooked spines have, on occasion, attached themselves securely to a sweater or two. A small price to pay for such a beautiful plant. A simple assemblage of plants, more or less thrown together over time, greet us on our patio area when we get up in the morning. Sometimes the best landscaping happens almost accidentally - though some thought went into this from time to time - mostly by Lynn-Marie. This is an unnamed hybrid we've had for a while. But names do not make the plant and this one does quite well all on its own. And right now, it's its turn. It's definitely summer now, with today's temperature getting to 87 F. The plants are loving it. This is an old specimen of Gymnocalycium pflanzii, originally sold to us as a seedling as var. lagunillasense, one of the many varieties and forms which have from time to time given to this highly variable species, but which are no longer accepted by most. It's a very impressive plant with a very nice large flower. It's native to Paraguay, Bolivia and Argentina and grows very easily as a potted specimen. Will burn if given too much sun, but appreciates fairly frequent watering during the warmer months. The most common hummingbird in our area is Anna's Humingbird and they stay year 'round but we find them visiting the nursery mostly in the spring and summer. Inevitably they end up finding their way into the greenhouses but can never find their way out. So...we end up catching them and then releasing them outside. This little female wasn't too happy about being caught but flew off good and healthy. 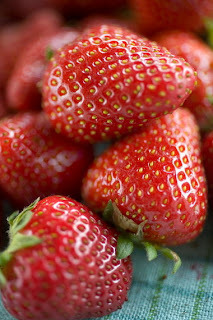 The strawberries are here in full force. Oh, we get strawberries from elsewhere throughout the year - Mexico, California - but there's nothing quite like the local "Hood" strawberries. The flavor is incomparable. And so I spent about an hour tonight preparing strawberries for the freezer and for tomorrow. It's Independence Day here and that means lots of firecrackers going off and lots of barbeques. But not for us. We'll be spending a simple day with fried chicken and fresh strawberry shortcake for desert. And we'll probably spend a little bit of time in the greenhouses too...but it is a holiday. In my opinion, Fockea edulis, is one of the best plants for creating a bonsai-like succulent planting. The form can vary tremendously from plant to plant, with all them being of interest. Plus, and this is a big plus, it's easy to grow. What's more to like? This plant - Echeveria tranthina - has a very unusual color and it's identification has often been uncertain. The type locality is the Barranca de Tolantongo in the Mexican state of Hidalgo. This is the first warm night of the year - mid 50sF - which I understand is all very relative. But we're used to cool nights, even in the middle of the summer. But it's going to be warm for the holiday weekend (Independence Day in the U.S.), with highs in the low 80s F. OK, you people in Tucson and Phoenix, stop laughing! Though our nursery list says we're out of stock on this plant, we'll be putting them back up as back in stock in a day or two. They're very popular and we have a hard time keeping them in stock. It's one of the forms of Echeveria pulidonis. It's hard to imagine that the July cactus society show and sale is only a couple of weeks away. Back to potting up more plants, etc. Volunteers, anyone? Another wonderful Aloe hybrid by Kelly Griffin, Aloe 'Lavender Star'. The leaves have a pleasing texture and have lovely lilac overtones, accented in bright light. It stays quite small, 6-12 inches, making a fine potted specimen. I'm quickly becoming an Aloe 'fan'.